The company has established its own brand of『CHANMAG』for more than 20 years. It has been producing baking machinery for many years. So far, we have accumulated many years of professional R&D capabilities and new baking technology experience. 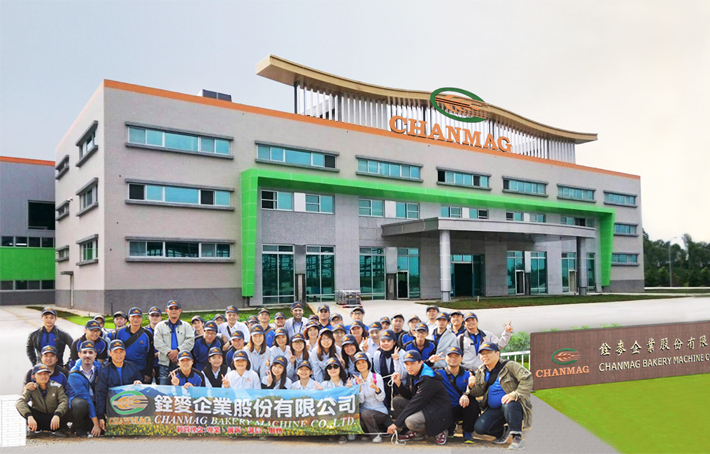 CHANMAG business vision the process is transparent with automated mechanical equipment, eliminating the cumbersome manpower process to create delicious and satisfying heart bake (Satisfactory Bakery), innovative professional baking technology (Innovation Technology), dedicated service heart driven by touched (Touched Service) for the mission! The elliptical such as run as endless as interstellar! Entirety logo symbolizes the steady growth in the Golden Triangle. Customers’ based on professional know-how with R&D, manufacture technique and satisfactory service attitude, to offer excellent bakery equipment, to contribute the bakery customers. Chanmag innovate to develop new product, enhance production technique, and improve product quality for providing more satisfactory product customers. Customers’ harmonious to unite together, keep sincere & honest, identify right & wrong, harmonious to concern each other, to unite together, to develop benefit for share with customers, subcontractor, colleague, stockholder and publics in the country. Service: reputation & affect comes from the service of company team. Customers’ satisfaction, quality request is promise of CHANMAG for serving the customers.